ZitstiK, Because Everyone Wants Clear Skin! Beauty doesn't have to be boring~Add some color to your skin care routine with the Top Quality ZitstiK in the Designer Color of your choice! - Available in Navy Blue, Kelly Green, Pure White and Classic Stainless Steel. - Textured handle provides a firm grip, while two different loop styles get the job done. Teens, Ladies and Men...We all want to look our best and have blemish free, clear skin. After using your ZitstiK, you will wonder how you lived without it! - For parents who see their teen feeling frustrated with their acne and are concerned about scarring, this will be a game-changer! - For women experiencing monthly breakouts or hormonal acne due to pregnancy, the ZitstiK provides a non-toxic way of eliminating blemishes. - For men dealing with occasional breakouts on the face or other areas of the body due to sports and exercise, the ZitstiK provides a quick & easy solution. Want to be featured on the ZitstiK page? - Upload a photo of you using your ZitstiK! - Or, Upload a photo of yourself holding your ZitstiK that coordinates with your outfit! We will periodically choose one to be featured on the main page! Like we said "Everyone wants clear skin" and "Beauty doesn't have to be boring"! So click the "Add To Cart" button now and be prepared when the next blemish strikes! SAFE & SANITARY REMOVAL OF BLACKHEADS AND WHITEHEADS: The ZITSTIK reduces swelling and acne scarring by properly clearing pores without harsh cleansers or medications. WORKS FOR ALL PARTS OF YOUR BODY: Use your ZitstiK for blemish and whitehead removal on all areas where clogged pores may appear such as back, neck and chest. 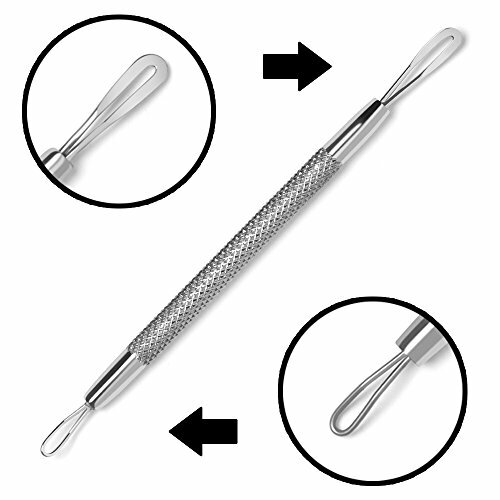 SIMPLE TO USE: Fast, convenient, single piece SOLID CONSTRUCTION with a textured handle for a firm grip. Double loops for hard to reach spots. These benefits make the ZitstiK pimple popper a comfortable and effective skin care tool. EFFECTIVE FOR ALL SKIN TYPES: For best results, use the ZitstiK comedone extractor for zit removal on skin softened with a warm washcloth or after showering. If you have any questions about this product by Zitstik, contact us by completing and submitting the form below. If you are looking for a specif part number, please include it with your message.